Dude Food? No way! It’s Ladies Night. 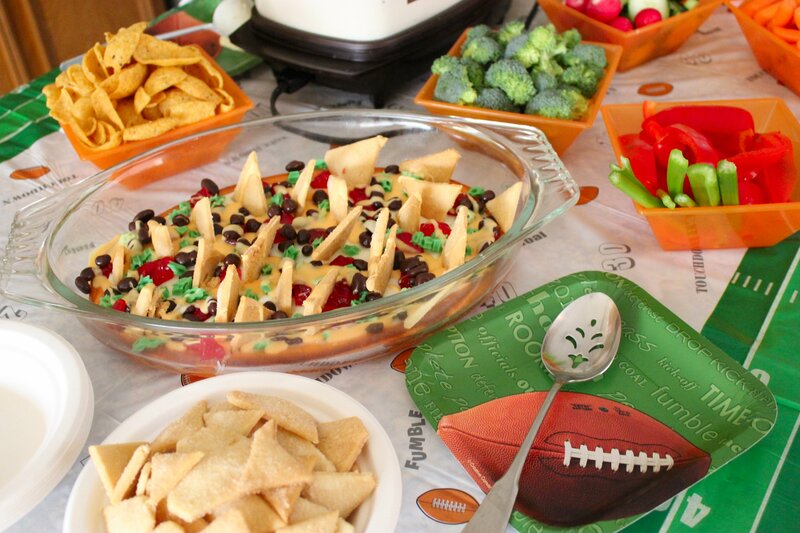 Are you ready for some football..... food? Who says women can’t enjoy football food? Or even football, for that matter. Okay, I’m just bluffing. I’m not really that into football, but I stand by my statement that good football food is not just for the guys. Last night, I hosted a Ladies Night for 8 friends with a pre-Super Bowl football theme, and we turned traditional game day snacks on their ear. Forget what you’ve heard about dude food. This one’s dedicated to the ladies. To start, there was the usual line-up of raw veggies and ranch dip. 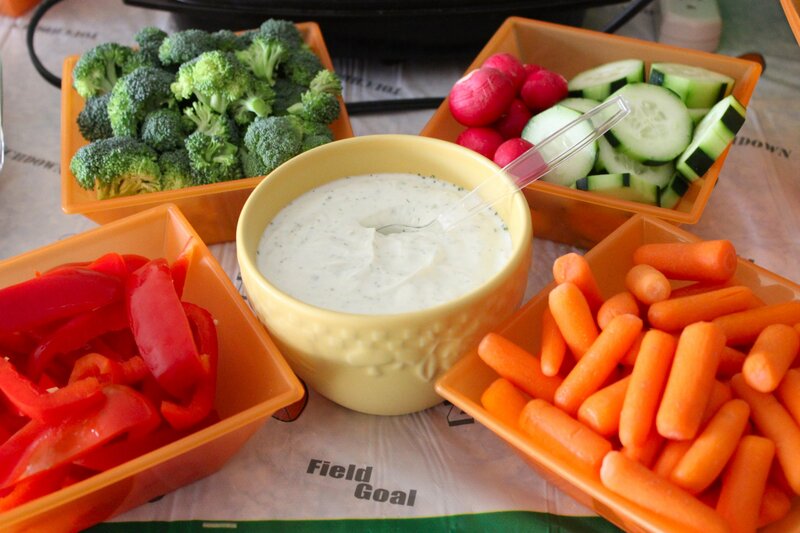 Crispy, crunchy veggies with homemade Ranch = yum! Want to know a secret? That ranch dip is fat free. I stirred one envelope of dry Hidden Valley Ranch dip mix into a 16-ounce tub of Fage 0% fat free Greek yogurt. And the kicker is that you’d never know it wasn’t made with full-fat sour cream. I’m not kidding. You can’t tell the difference. At all. 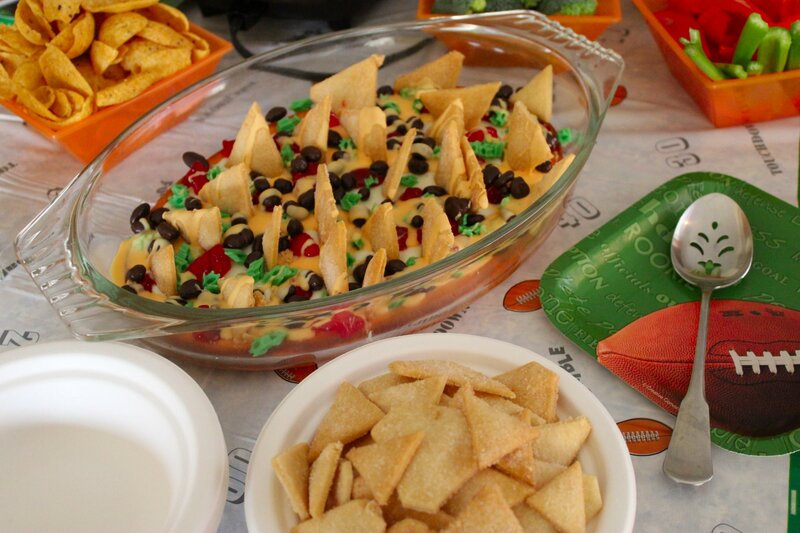 Of course, it’s not a party without a good layered nacho dip, am I right? 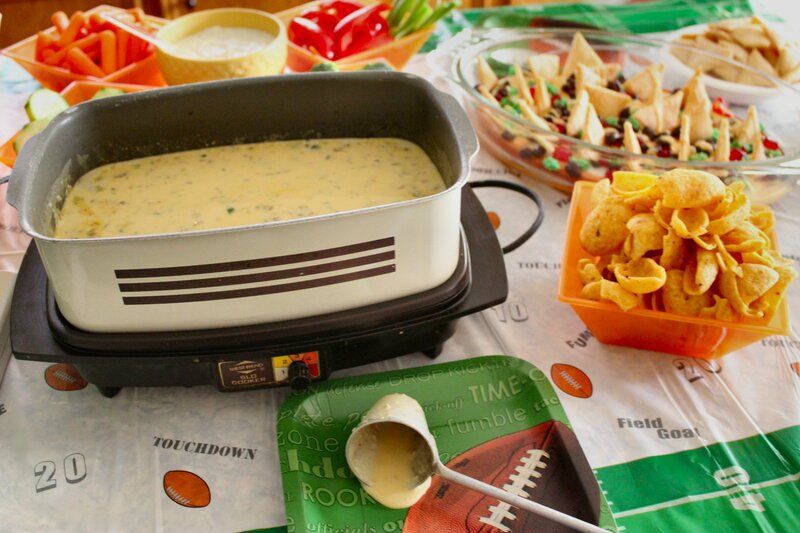 And I don’t know about you, but come game day – I hafta get my queso on. This is my recipe for easy Queso Blanco. In a large saucepan, brown one pound of hot breakfast sausage, mashing it into little pieces as it cooks. If it’s too greasy, drain it. Throw in 2 cans (4 ozs. each) of roasted mild green chilies, 2-3 diced jalapenos (depending on how much heat you can take), a one-pound box of Velveeta (cubed) and one pound of white American cheese from your grocer’s deli (sliced thin works well since it melts faster). Put a lid on the pan and let it simmer over low heat until the cheese is mostly melted, then add enough milk to bring it to your desired consistency. I like mine in the medium range. For me, runny queso is no bueno and queso that’s too thick makes me think of my colon and the prune juice I’ll be shopping for tomorrow (sorry for the visual). Next up, my take on buffalo wings. Here’s my take – they’re too dang messy. Buffalo Chicken Rolls - much easier to eat, ladies. Taking inspiration from my phobia of dirty hands and the blog ‘Can You Stay for Dinner?’, I made Buffalo Chicken Rolls instead. Andie’s version is fancier than mine, but she inspired this treat. To start, I simmered 6 boneless/skinless chicken thighs and 2 boneless/skinless breasts until they were fall-apart tender, then I let the cool and chopped them into tiny bits. I threw them in a bowl and tossed them with one 16-ounce jar of Hooter’s Wing Sauce and 1 1/2 cups of grated Monterrey Jack cheese. I stirred it all together until it formed a cohesive ball, then I scooped it one tablespoon at a shot onto wonton wrappers. Using a little water around the edges so they would stick, I rolled each wonton wrapper into a miniature eggroll. Once they were all wrapped, I placed them onto wire racks set over rimmed baking sheets (because the oil from the wing sauce WILL find a way to leak out), sprayed them lightly with cooking spray to help them crisp up, and baked them for 30-40 minutes at 350F until they were golden brown and crispy on the outside. Served up with a bottle of Frank’s Red Hot wing sauce and a bowl of creamy blue cheese dip, these had all of the flavor and none of the mess of traditional hot wings. It was a total win/win. Next up, my friend Kaki’s award winning championship chili with all the fixins’. The chili station. I want to live here. I can’t give you the recipe for Kaki’s chili. Seriously, it’s her competition chili. And when I say competition chili, I am NOT. MESSING. AROUND. She travels the U.S. with her new cutie patootie husband competing in state and national chili championships. She doesn’t have a sash, but she is a former Arizona state champion. Her husband competes, too, using his own special recipe. He’s a former Tennessee state champion. No foolin. They’ve been to nationals, y’all! So while I can’t share the recipe, I can tell you that Kaki’s chili is thick and beefy and has just the right amount of burn that radiates through your entire palate when you eat it. It’s perfection. Please don’t ask if she puts beans in it, or I’mma hafta hurt you. Sorry, but it’s a Texas thing. If you’re like me you’re already thinking ‘yeah, that’s great… but where’s dessert?’ Did you miss it? I’ve already shown it to you. Let’s take a closer look. That's not layered dip. It's Nacho Average Cheesecake! That’s right. 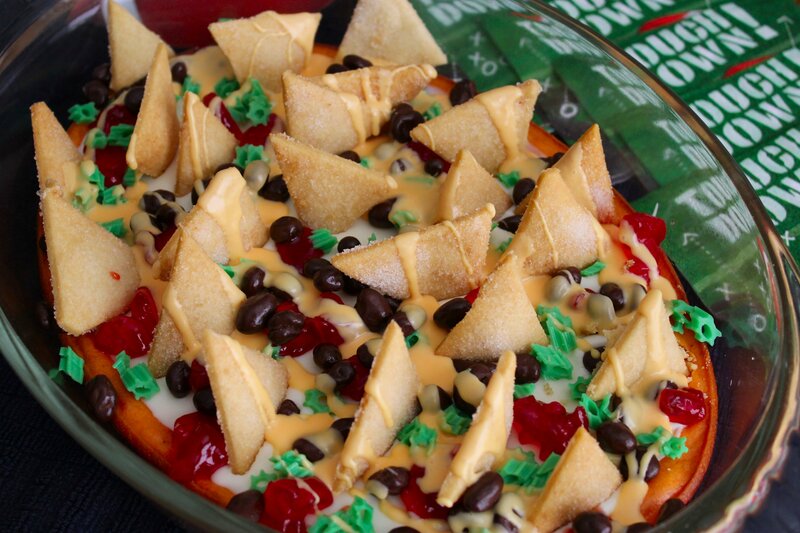 That pan of layered nacho dip is not dip at all. It’s a cheesecake. Go ahead and take a minute to be blown away. Give me your best E-Trade baby ‘surprised face.’ This clever little beauty came from the Food Network Magazine. 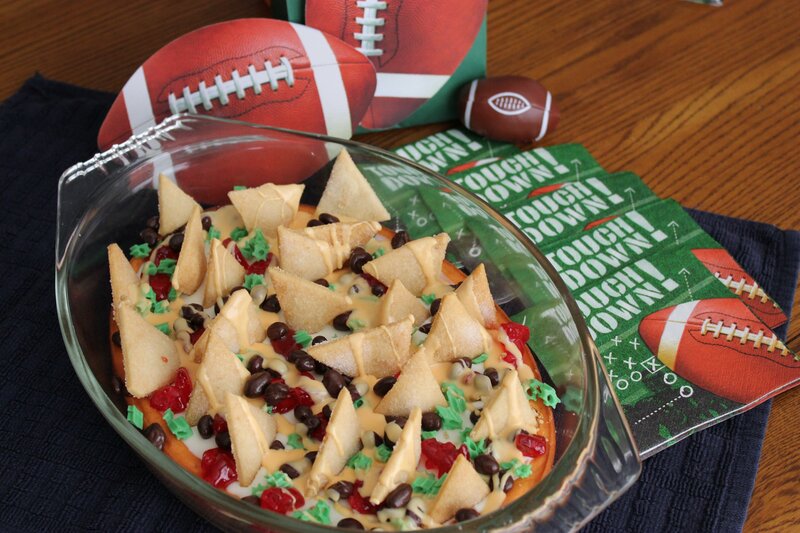 Not only is it the most adorable football game day dessert ever, but it was also a ton of fun to make. Basically, it’s a simple cheesecake topped with various candies and pie crust ‘tortilla chips’ that so closely resemble the real deal, most of the ladies walked right up to it and had no idea it was dessert. So not only is it fun to make, and extremely clever, but it also serves as an awesome ‘I just punked my guests’ surprise that no one will ever see coming. I can’t share the recipe since it’s copyrighted material, but Food Network has it posted online here. I will tell you that I made one substitution. Instead of using sour cream, I used an inexpensive tub of store brand cream cheese frosting. Half the tub went over the top of the cooled cheesecake to mimic sour cream, and the other half of the tub was tinted orange to mimic the melted cheese poured over the top. I left off the black licorice fake olives. Eeesh… can’t stand black licorice! Best. Game Day Dessert. Ever. You have to try this one. Please promise me you’ll try it. It will put the fun back in Super Bowl Funday. So Dude Food? It’s a total myth. And we just debunked that sucker. Booyah, boys! I was all ready to take up residence under the chili station until I saw the Nacho Cheesecake. I think my sweet tooth squeed a little bit! What a deliciously adorable spread. You Know Gameday Chow, my Friend! Why, thank you. Thank you very much. It was a lot of fun putting this one together. And even more fun proving that girls can rock football any time they want. Or at the very least, football food. Whenever you’re ready to come visit, I’ll save you a space at the chili station. Right next to the Fritos and cheese. Nice spread! I like to watch football from time to time, but I’ll admit I’m looking forward to Sunday more for the dips I hope to make rather than the game. And I definitely won’t be eating chicken wings – I just don’t “do” wings. But those chicken bites you made sound like a great sub! Thanks, Meghan. I like to watch occasionally, too, but I’m not really a follower of either of the teams playing this year. Still, I’ll watch if it means queso and grilled meat and brownies. For me, it’s more about the football food and the funny commercials. Love that E-trade baby. Love the cheesecake! It looks awesome! Love the football food, too! I think Super Bowl Sunday resides right behind Thanksgiving/Christmas food for me in the ranking of favorite food days! YUM!! 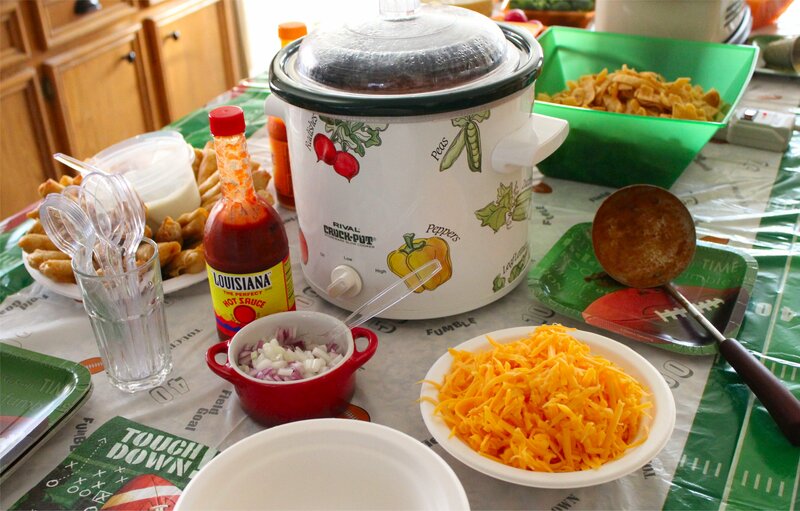 I gotta say….a party ain’t a party till you roll out the queso!! You said it, Carrie! Maybe it’s just a Texas thing, or a southern thing, but queso = party every time. That nacho cheesecake looks soooooo awesome! This is all adorable and makes me wish there was a buffet happening in my kitchen right now. Delish! Josie really wants you to make the buffalo chicken roll-ups. And she said not to skimp on the blue cheese dip. What a diva. YUM!! The only thing I love better than a good spread of football/potluck day food is Fair Food and your post looks YUMMY!! I think I will be making the Buffalo Rolls for Sun. & taking them to our friends. I will give you credit of course!!! I have to make brownies for dessert (I’m a brownie kind of gal) so the cheesecake may have to wait, darn it! Thanks again for the great ideas!!! Love your site!!! I love Fair Food! The pineapple whip at the Tulsa State Fair was a favorite from years past. It was like pineapple sherbet soft serve, and it was FABulous. More recently, I swooned over deep-fried oreos at the Houston Livestock Show & Rodeo. It’s amazing how good an Oreo can taste when it’s battered, fried and dusted with powdered sugar. Seriously. 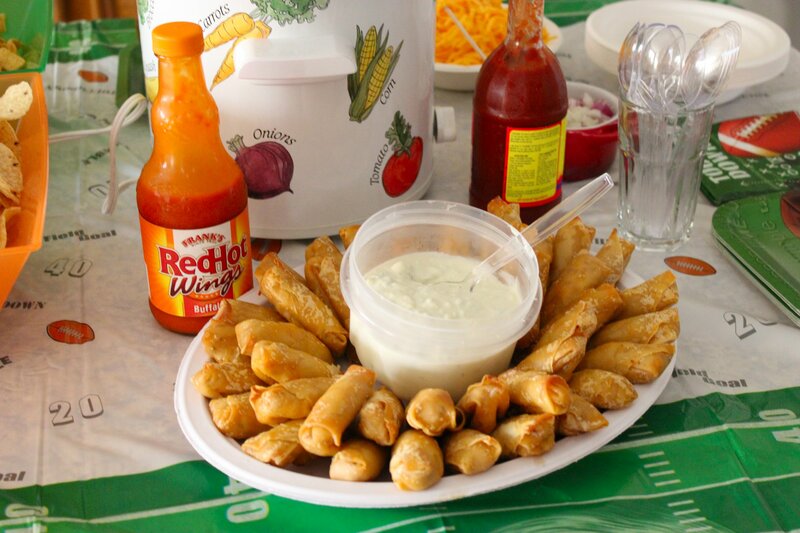 Hope you and your friends enjoy the Buffalo Rolls. Don’t forget the Frank’s Red Hot and the creamy blue cheese! I bought Marzetti’s Ultimate Blue Cheese Salad Dressing (it’s refrigerated & found with the produce), then stirred in 4 ozs. of Amish blue cheese crumbles to make it even cheesier. Good luck! Love the dessert–I might just have to try it. Thanks, Monica. But given the choice between massive waves crashing on Hawaiian sands or eating snacks & watching football, I’d rather be doing what you’re doing. Wanna trade places? Just for a day (or a year or two)? It was a lovely pregame party!!! Carl and I are still enjoying those yummy peanut dark chocolate cookies. They are great. He thanks you too. It makes me very happy to know that Carl the Cookie Monster is enjoying his treats. Hope you’re getting plenty, too! Um, Nacho Average Cheesecake? Who are the people who come up with this? Absolutely ridiculous. You also win the award for best food suggestion to date. I’m totally saving the Buffalo Chicken Rolls for a rainy day where I need to knock Marcus’ socks off. I pinky swear to give you all the credit. For the record, in this house, Dude Food = Kat Food. We live to feast. Dude Food = Kat Food. Awesome. I don’t know who the creative genius at Food Network was that created that nacho cheesecake, but I wish I’d thought of it first. So clever! We tied on the feed bag for the big game, even though I’m more about the commercials & snacks that the actual playing of football. More buffalo chicken rolls (fried this time, and the crispy factor was a 10+), soft beef tacos, nachos, and get this – liege waffles topped with dark chocolate and whipped cream. It was insane. Hope I can sleep tonight. Nachocheesecake. Let me pause right now and give it the respect that glory on high deserves. And then I’ll drool in amazement. It was fun – as a dessert and as a prank. No one knows it’s a sweet treat when they see it. Your mind just automatically goes into “7-layer dip” mode. Now I’m trying to think of all the other classics that could be remodeled into desserts. Pizza’s been done. Dessert eggrolls have been done. Sushi’s been done. I’ve even seen sweets that look like fried eggs and bacon. Geez… what’s left? I loved this post! I enjoy your writing so much..yes, even when you mention your colon and prune juice. I adore this nacho cheese dip we call Rotel very very much too. I think it might pulse through my veins. Well, the first step to attending the festivities at my house is to make your way back to Texas. I’m sure northern California is swell, but it’s not Texas. Actually, I’m pretty sure northern California is gorgeous and wonderful, so I can’t hold it against you. I’m glad you enjoyed the post. Like most good Texans, chili and queso DO course through our veins. And we wouldn’t have it any other way. For readers, Christina bakes fabulous desserts and treats in a blog called Dessert for Two. I hope you’ll click over to visit. If you do, leave a comment and tell her I said hello. That dessert looks fantastic. How did it taste? I’d have to swap out the chocolate covered espresso beans for root beer jelly beans as I don’t like coffee or its beans. But I love cheesecake. How do you feel about dark chocolate Raisinettes? That’s what I used for the black beans. They were actually pretty tasty. As for the cheesecake, it’s just a basic plain cheesecake recipe. With all the candy and frosting on top, it was a little too sweet for me, but it looked awesome and the girls loved it. I’m not really a fan of super sweet desserts. I’m more of a plain vanilla custard kind of girl. Or a fruit cobbler lover. I even like my chocolate dark or bittersweet. I’d still make it again for a football party or a Ladies Night. It was pretty cool.